LA JOLLA, CA – April 4, 2018 – Red blood cells are on a wild ride. As they race through the body to deliver oxygen, they must maintain a distinct dimpled shape–and bounce back into form even after squishing through narrow capillaries. Red blood cells that can't keep their shape are associated with diseases like sickle cell anemia. In a new study, Velia Fowler, PhD, and her lab at The Scripps Research Institute report that a protein called myosin IIA contracts to give red blood cells their distinctive shape. The findings, published this week in the journal Proceedings of the National Academy of Sciences, could shed light on sickle cell diseases and other disorders where red blood cells are deformed. "Red blood cells have been studied for centuries, but there are still a lot of unanswered questions about how they adopt their shape," says Alyson Smith, graduate student at Scripps Research and co-first author of the study. "Our study adds an important piece to this puzzle." Red blood cells look like puffy disks with concave "dimples" on top and bottom. But the blood cells of people with certain disorders take on other shapes. In severe forms of sickle cell diseases, genetic disorders most common among people of African descent, the cells are shaped like crescent moons or sickles. These misshapen cells are rigid and sticky, causing them to become stuck in blood vessels, which prevent the blood from carrying oxygen throughout the body, causing anemia. About 300,000 children are born with sickle cell anemia each year, and there is currently no cure for these disorders. Scientists have long wondered how healthy red blood cells maintain their dimpled shape, and whether it is a passive or active process. Are they just like rubber inner tubes that passively bounce back to their former shape after being squeezed or bumped? Or is something mechanical in the cell membrane–the outer skin of the cell–actively contracting and relaxing to maintain the shape? Answering these questions could also help explain what goes wrong when red blood cells are too rigid to deform easily as they flow through blood vessels. Smith and Roberta Nowak, a research assistant, led the work to solve this puzzle, which had piqued Fowler's interest since she was a postdoctoral researcher in the 1980s. They found that red blood cells actively regulate their shape, thanks to myosin IIA–which is related to the protein that drives muscle contraction in other parts of the body. The team used advanced microscopes at Scripps Research to capture 3D images showing myosin IIA under the cell membrane. The researchers found that red blood cell myosin IIA molecules assemble into barbell-shaped structures called filaments. Specialized regions at both ends of the myosin IIA filaments can pull on a membrane-associated structural protein called actin to control the stiffness of the cell membrane. "You need active contraction on the cell membrane, similar to how muscles contract," says Fowler. "The myosin pulls on the actin to provide tension in the membrane, and then that tension maintains the biconcave shape." The team then treated red blood cells with a compound called blebbistatin, which stops myosin from working properly. They found that the treated cells lost their ability to maintain a shape and looked floppy and unhealthy. This further confirmed that myosin IIA is important for maintain red blood cell shape. Understanding the architecture of the membrane is an important step toward finding the causes of diseases where red blood cells are deformed. Fowler says there might be a chance someday to inhibit myosin IIA in red blood cells and restore some of elasticity they lose in sickle cell anemia, letting them bend and fit through capillaries. "Even just a small change in those sickle cells might be enough," says Nowak, who served as study co-first author with Smith. This view of red blood cell shape has sparked many new questions. The study suggests that cells use a process called phosphorylation to make the myosin IIA filaments on the cell membrane more stable–but how this process is controlled remains a mystery. Going forward, the researchers hope to learn more about what regulates myosin IIA's activity in red blood cells and even other cell types, like neurons. 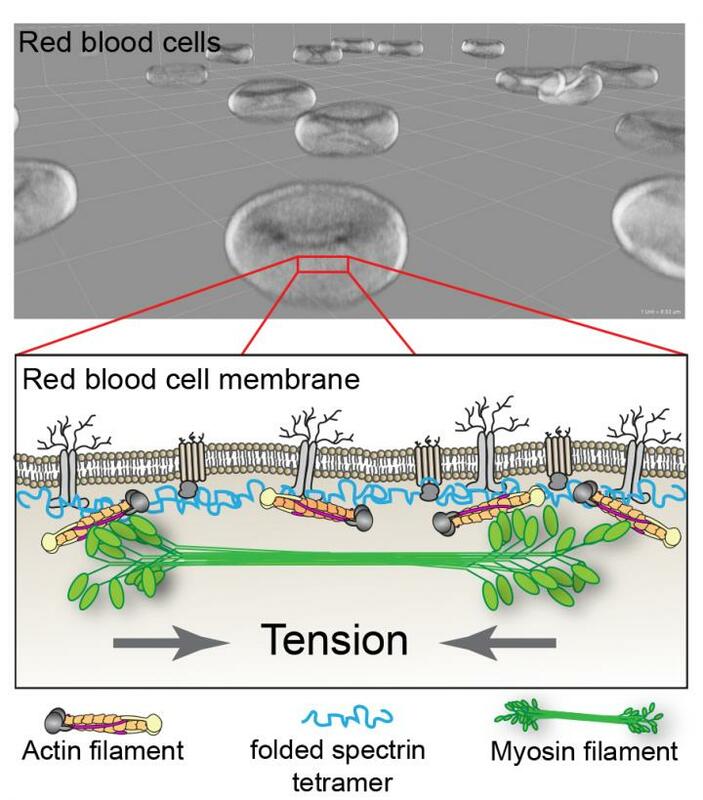 The study, "Myosin IIA interacts with the spectrin-actin membrane skeleton to control red blood cell membrane curvature and deformability," included authors from the Rochester Institute of Technology, The Feinstein Institute for Medical Research, Beth Israel Deaconess Medical Center and the Donald and Barbara Zucker School of Medicine at Hofstra-Northwell. The work was supported by the Whitaker Foundation, the National Institutes of Health (grants GM34225, HL083464, HL134043 and HL126497), a National Science Foundation award (CBET 1560709), the NIH/NCATS CTSA Award (grant UL1 TR001114) to the Scripps Translational Science Institute, and an Allied World St. Baldrick's Scholar Award.